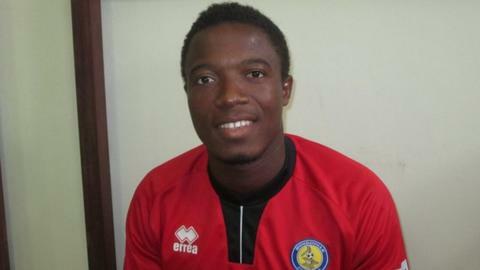 AC Bongoville's Sylvain Azougoui has died after being kicked in the head during a league match in Gabon. The goalkeeper died on the way to hospital after the incident during a match against Centre Mberi Sportif. The 30-year-old from Togo had just stopped a shot on goal, but the attacker lost his balance on the wet grass and stepped on Azougoui's head. "It is truly difficult to see how fate can be so cruel," a statement on the club's Facebook page said. "He had been decisive and exemplary on several occasions when AC Bongoville were in difficulty - and knowing that he is leaving us so young because of an innocuous blow is truly sad." Sunday's game was played in Bongoville almost 800 kilometres from Gabon's capital of Libreville.